Cooking with chicken is always fun to do. Chicken can be cooked for a variety of foods. Moreover, all people from children to adult love to eat chicken. If you need a new recipe to cook the chicken on the refrigerator why don’t you try the Hasselback cheese puff fried chicken recipe below? It is easy to prepare and most people love to enjoy fried chicken, isn’t it? Instead of buying it, you can cook it by yourself at home. This is instruction and video about How to cook Hasselback cheese puff friend Chicken properly. The key to cooking this menu is on the way how to cook the chicken. By cooking it perfectly, you will have a crunchy fried chicken without losing the juicy of the meat. So, let’s take a look at the steps to cook this menu. Prepare the chicken breasts. Sprinkle it with a pinch of salt and pepper. To make sure that chicken breasts absorb the ingredients, you can slice the breast a little bit. Slicing the surface of the chicken breast is also a good idea to get a beautiful texture. You may let it for a few minutes. Now put the chicken breast in a large or medium-size bowl. Pour the buttermilk on it. Add a packet of ranch seasoning mix. Stir this mixture to make the buttermilk and seasoning mix are absorbed by the chicken breast. When you think it is good enough, you have to cover up the bowl. This is the time to marinate the chicken. Let the chicken in the refrigerator for 4 hours or even overnight before using it. Meanwhile, you can prepare another part of this menu. Take the cheese puffs and put in a food processor or blender. Crush the cheese puffs until becoming powder. Take the chicken breast from the frig. Take one of the chicken breasts from the marinade mixture and put it on the cheese puffs powder. Make sure that chicken breast completely covers up with the cheese puffs powder. Repeat this process for all chicken breasts in the recipe. By the time you finish with the cover up the chicken with cheese puffs powder, roll the chicken breast, In this step, you will know why you need to slice the surface of the chicken breast, The texture looks good after you roll it. Use a toothpick to keep the chicken breast on its shape. Repeat this step for all chicken breasts. Prepare a frying pan with boiling oil. Fry the chicken breast for 5 minutes at 350 Fahrenheit or 175 Celsius degrees. Take the fried chicken breast from the frying pan after 5 minutes or until it looks golden brown. That’s it! Hasselback cheese puff fried chicken is ready to serve! 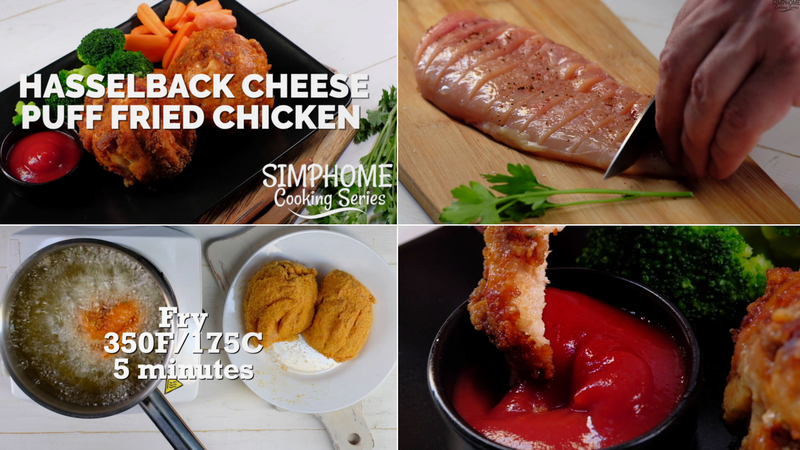 Serve the Hasselback cheese puff fried chicken with steamed broccoli and carrots and also chilly sauce. Related ideas: Cheesy taco breadsticks and Chicken parmesan.